Frank Robinson is scheduled to meet and greet fans and sign autographs and memorabilia at 11:00 a.m. August 5, 2016. An autograph ticket must be purchased for every signature you want. (Except free autograph guests.) Autograph tickets may be purchased in advance, or on-site at the TRISTAR Autograph Ticket Booth. Fees vary for each guest. 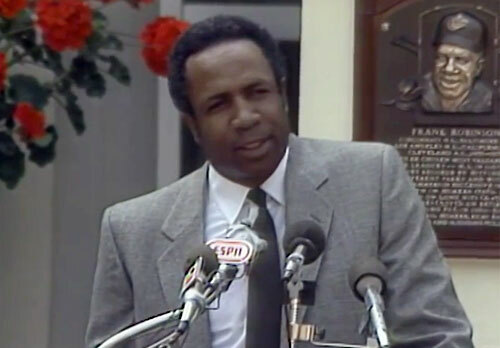 Frank Robinson is a National Baseball Hall of Fame Hall Of Fame Outfielder and Cancer Survivor who played for the Baltimore Orioles and the Cincinnati Reds. He was named Rookie with Cincinnati in 1956 and had 10 seasons with the Reds. Robinson won his first National League MVP award in 1961 while leading the Reds to their first pennant since 1940. After being traded to Baltimore in 1966, Robinson had his best season – he won the Triple Crown with a .316 average, 49 homers and 122 RBIs plus he also lead the American League in slugging percentage (.637) and runs (122). Robinson not only won the AL MVP but also helped the Orioles to their first pennant. During the World Series, he batted .286 and hit two homers as the Orioles swept the Los Angeles Dodgers. He was named World Series MVP. Although he never again matched his 1966 numbers, he was a central figure in three more Baltimore pennants (1969-71). Robinson was elected to the Baseball Hall of Fame in 1982. PFP Sports & Celebrity Talent Agency is a top booking agent for motivational sports speakers and celebrities. If you would like to book MLB stars like Frank Robinson for a speaking engagement, personal appearance or special event, you can request Frank Robinson agent and speaker information from PFP Sports & Celebrity Talent or call 800.966.1380.